taly-based helicopter manufacturer AgustaWestland announced plans to install a Flexform fluid-cell press from Avure Technologies at its PZL-Świdnik factory in Świdnik, Poland. 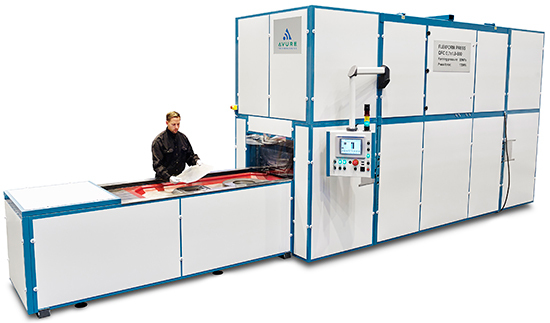 The Avure model QFC press features a forming area of 27.5 by 72 in., and will provide a production capacity of several hundred thousand sheetmetal parts per year. PZL-Świdnik’s new press, the latest model in the Avure fluid-cell family, generates a forming pressure of 17,000 tons, allowing it to quickly and efficiently produce finished sheetmetal parts. With tandem forming tables that can accommodate several parts per cycle, the press promises to boost productivity and capacity for Poland’s largest helicopter manufacturer. PZL-Świdnik expects the press to increase its capacity by 30 percent, while initial tests indicate a substantial potential to reduce labor hours and fabrication steps. The increased quality and capacity will allow the plant to meet growing demand in the aviation industry. And the high forming pressure will allow the firm to achieve tighter part tolerances and lower per-part production costs.